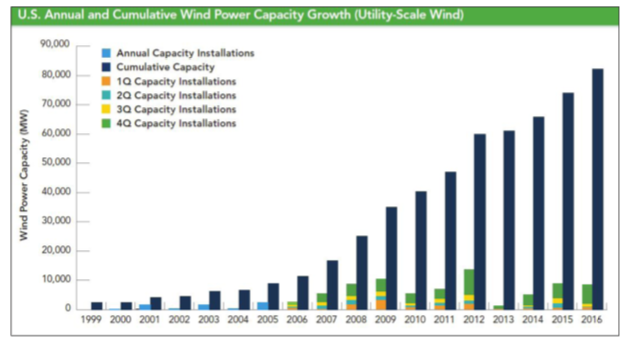 The American Wind Energy Association (AWEA) is constantly bragging about increases in installed wind capacity. Such claims, however, are very misleading. The real issues are: How much electricity can this installed capacity actually generate, and will it be available when it’s needed? 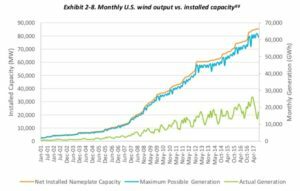 Claiming that 30% of all new capacity is from wind is very misleading because that capacity can’t generate very much electricity. 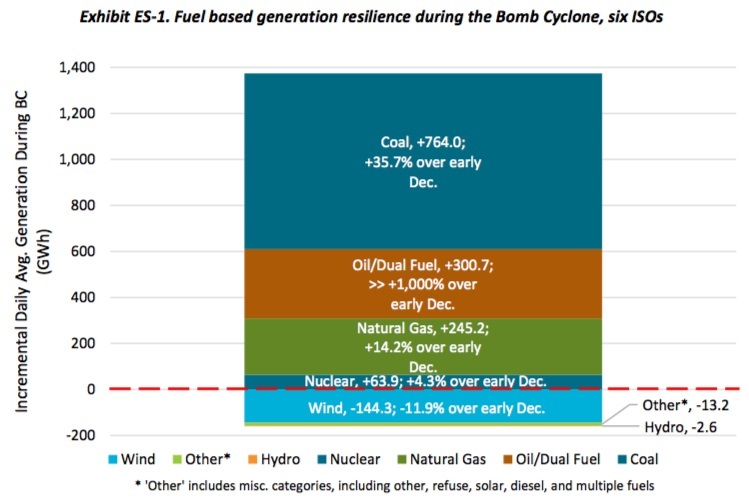 This chart from the Department of Energy (DOE) shows how little electricity is generated by wind, despite its seemingly large installed capacity. 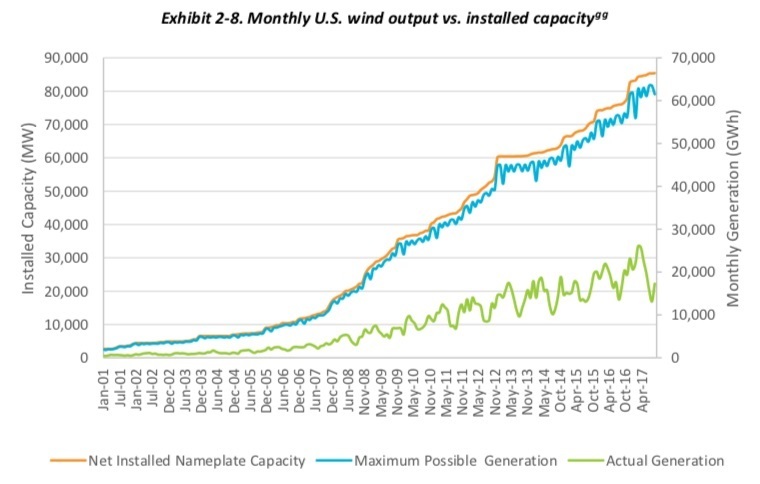 Source DOE: Green line wind generation, top line shows the installed nameplate capacity. Even more important, the electricity may not be available when it’s needed. On very hot days, especially in the afternoon, the wind is prone not to blow. Yet this is when electricity is needed because of additional air-conditioning load. On cold winter days, the wind may blow either too hard, or not enough. The LCOE for existing coal-fired power plants was referenced because it’s very difficult to obtain honest cost information. The EIA currently only publishes cost estimates for plants coming online in 2022 which are speculative, at best. 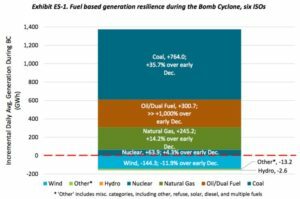 During the past several years, the EIA added an extra charge of $15 per ton of CO2 to its estimates for new coal-fired power plant LCOEs, distorting actual costs and making it impossible to use EIA data for cost comparisons. The amount of electricity actually produced from the huge investment in wind power is not only very small, it is unreliable and may not be available to meet peak power demand during hot (still) summer days. And during winter storms, wind power may fall off because the winds are too strong. So much for the notion that wind is there for the taking. 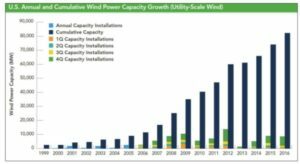 AWEA should be ashamed of itself for bragging about the increase in installed wind capacity and leaving the rest of the story untold. But in the crony world of wind energy, image and half-truths are everything. I have recently found some updated 2017 costings from US EIA that changes my earlier cost model significantly.